Often we expect God to use other people to serve as the catalyst for our spiritual breakthrough. Other people seem more spiritual, more gifted, or, at the very least, more experienced than we know ourselves to be. We ask God to move in our lives or to speak to us in a more intimate or life-changing way, and then we hesitate when He does. Somehow, when God confronts us with the reality of His greatness and our inadequacy, we are overwhelmed with the understanding that we are only dust. However, He wants us to recognize that His presence is with us in our destitute state and that He has already put something into our hands — something that may look ordinary to us but that He plans to use as an instrument of His power. 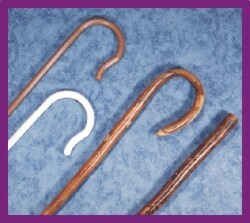 In Exodus 4:2, God asked Moses, “What is that in your hand?” Moses stated the obvious: a staff. The Lord wanted Moses to acknowledge what he was holding in his hand; Moses then was instructed to wield that staff as God directed. If we simply submit ourselves to God and acknowledge the ordinary things that are in our hands, God will use us for His purposes. He will direct us. Yes, He has given us the various members in the Body of Christ for the purpose of supporting and encouraging one another. Yes, some people may be more gifted than others in certain areas. However, we all have something in our hand that God can and will use, if we will declare ourselves willing. Don’t shrink back when confronted by an opportunity God offers you. Resist the temptation to say “Please send someone else” (Exodus 4:13b). Don’t wait for a more powerful prayer warrior to come pray for your sick friend. Don’t wait for a more eloquent speaker to explain the truth about the life and freedom in Jesus Christ. Don’t wait for someone with a more dramatic testimony to share the love of God with your friend. Start where you are, with what is already in your hand. God will transform it with His amazing power. He wants to visit YOU!